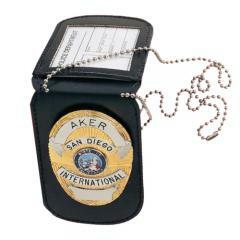 The Aker 597 Neck Badge and ID Holder is an all-in-one carrying solution for your identification card and badge that is perfect for covert wear. Its rectangular shape and rounded ends fit all styles of badges, and a convenient Velcro hook and loop closure holds them securely in place. The premium cowhide outer layer resists damage and wear effectively, protecting your ID card, and comes in black or tan. The holder also features a heavy-duty beaded chain for around-the-neck carry, allowing you to hide your badge under clothes while maintaining accessibility. It is well made and works well. Perfect for the shield style badge. ID holder is a big plus. Written by: Sgt. Jorge L.
Perfect fit for my Badge.